CRISPR editing workflows can be complex and time-consuming. Having an efficient screening method can decrease results turnaround time. The AccuCleave kits streamline gene editing workflows by reducing the amount of NGS and Sanger Sequencing screening required. 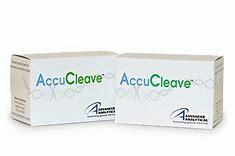 A simple and accurate enzymatic assay based on heteroduplex cleavage is employed as a screening method in the AccuCleave T7 Kit while the AccuCleave C2 kit provides robust assay controls.